After S and J Signs go through examination of the property and surroundings, we can determine where signs are needed at the site for identification and directional purposes. On-site technicians take accurate measurements and photos, and determine if there is electrical access and local code information. The goal is to increase visibility & access to your sign to maximize the volume of traffic that passes your location. At S and J Signs, we understand that a creative and marketable sign is necessary to attract the targeted audience. Our company’s design team incorporates all logos and related material into the sign it builds for the prospective client. They work close together with our engineers and production managers to assure an elegant and functional sign design. The project management team’s primary focus is to assure that the customer requirements are achieved and all projects are tracked from start to finish. S and J Signs are accustomed to working under tight deadlines. S and J Signs aims high to make sure your project is done right the first time. All manufacturing is done in-house, using lighting supplies to produce high-quality signs. We will manufacture your sign based on an existing design and specifications or based on a completely new design concept. S and J Signs team has over 25 years in combined experience, so you can count on us to deliver. 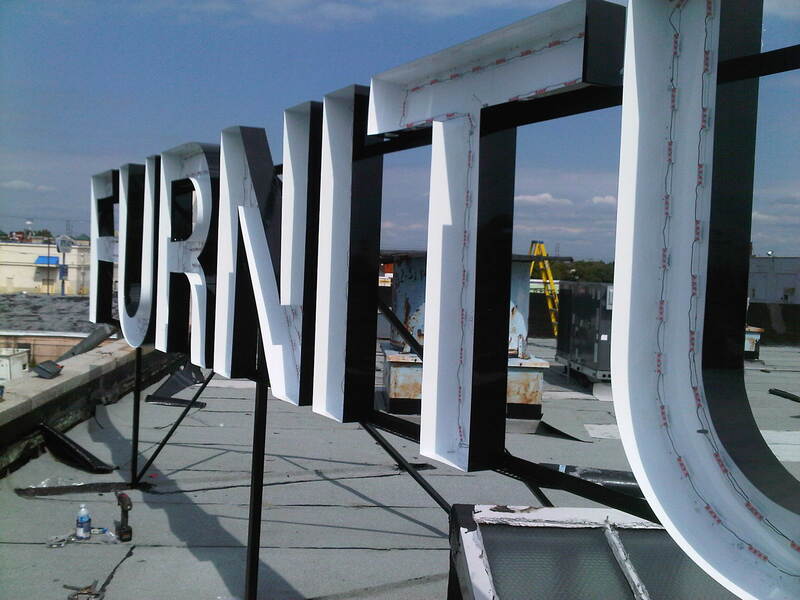 S and J Signs offer sign repair and installation services. Trained and qualified technicians drive to your site to install the sign using sophisticated equipment including cranes and ladder trucks. Our Sign installation services include: Banner Installations, Graphic Installation, and Store Re-Branding Services. S and J Signs, repair and installation maintenance is a no-hassle way to protect your organization’s image and reduce liability by keeping your signs and lighting at peak working condition. We charge a flat monthly rate with no hidden “extras”. This eliminates invoices to review and unexpected sign repair expenses. All above ground labor and materials for maintenance or repairs for the signs and lighting listed in the agreement are covered. This includes neon, transformers, housings, lamps, ballasts and wiring. As an added value to our maintenance clients, we send out regular night patrols to check your location thoroughly. This often allows us to dispatch a technician to repair outages before anyone at your location has even noticed them. For companies that do not have a maintenance agreement with S and J Signs, we offer sign repairs and installation services on a time and material basis. Our prices are competitive; our expertise and equipment are unrivaled and we respond in a timely manner. Many needed sign repairs and lighting outages go unnoticed during daytime working hours. Letting theses problems go unresolved can hurt your business, damage company reputation and jeopardize safety in some cases. S and J Signs offers night patrol services to regularly check signs and lighting during the night when problems are most visible. We supply the best quality and widest selection of LED products available at the industry’s lowest prices. Making the transition to LED will save you in both energy and maintenance costs as they use only 20%–25% of the energy and last up to 25 times longer than conventional lighting. With S and J Signs our repairs and installations can advise your business with the perfect energy saving solution for all your lighting needs.